I have two of each of the following magazine subscriptions to give away. 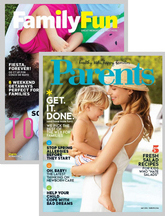 These magazines are the essential guides for families with growing children. Their editorial focus is on family formation and growth as well as getting maximum enjoyment from family life. Features include child development, health, finance, child care, education and discipline, as well as fun ideas for activities, crafts, vacations and educational toys. This home and family service magazine is designed for husbands and wives who have a focal interest in the home and family. It services its readers in the form of ideas, help, information and inspiration to achieve a better home and family. I sure would love to win a Better Homes and Gardens subscription! Thanks for offering this.